Magento 2 One Step Checkout - the best solution for your store! Magento 2 One Step Checkout extension by Mageplaza helps reduce the abandonment rate as well as increase the conversion rate dramatically. Ignore the back and forth that are the redundant motions when standing on your site. Google Maps Suggestion Integration allows showing all relevant suggestions with full of address information based on the entered characters before. Especially, an advanced feature coming only from Mageplaza is Find me. The functionality automatically locates the customer's current position when tapping it, then the address field is auto-fulfilled. To simplify the checkout process, One Step Checkout module gathers all complicated default steps to display on one page only. One Step Checkout module for Magento 2 is a 100%-open-source code. The store owner is easy to change the specific appearance from the admin configuration like displaying color or checkout layout: 2,3 columns, Flat or Material Design. In addition to the well-documented code, the settings containing comments and the great auxiliary guidance notes can help you customize with ease. With over six years of comprehensive experience in Magento Module Development and especially in the development and support of One Page Checkout for Magento 2, you will be really carefree that our module is well compatible out-of-box with nearly 100% of the third extensions such as shipping/ payment providers or loyalty extension or credit module, etc. In case our extension is not directly compatible with the others, we will work with the third provider to fix it in the perfect way without any extra fee. Automatically sending emails to customers to remind them about their abandoned carts and offer them a discount. Built-in report features helps store owner keep track on figures like cart abandonment rate, recovery rate and sent error. 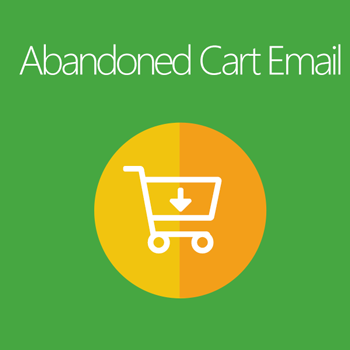 There are 5 ready-to-use email templates coming in handy that help you fight the cart abandonment issue. The Custom Checkout Fields management with the drag and drops feature will surely make it more effective for the store admin to configure the Mageplaza OneStepCheckout. There are more than ten available fields, it support Checkout fields checkout and Customer Attribute extension. Store admin can choose which field to display to fit with the store orientation by drag the requirement fields to the sorted fields and leave the unnecessary ones in the available fields then click on Save it. 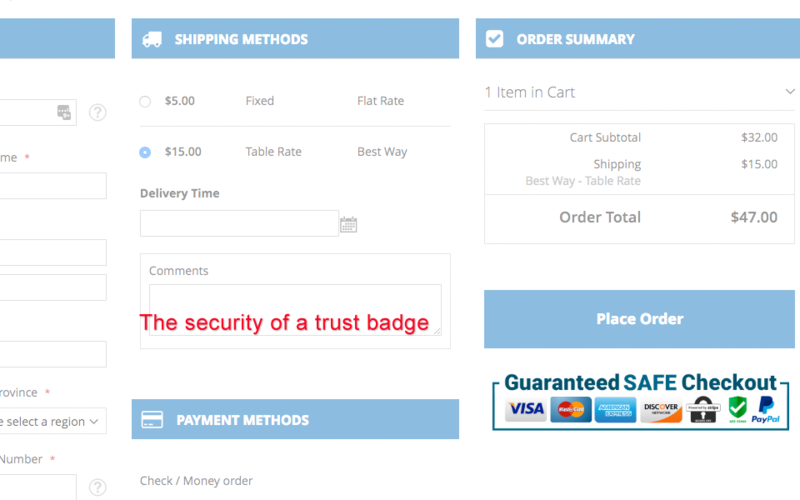 Checkout page is one of the most important places to add the security of a trust badge. These small trust marks can give an significant impact on a store's conversion rates and help you get more revenue from existing traffic. A seal static block can be shown under the Place order button. This can be a place to feature secure payment guarantee checkmarks or possible payment methods. "Mageplaza treat you as we would like to be treated"
"I extremely impressed with the auto-suggest address functionality by this checkout extension. It is a great feature. Love it so much!" "Amazing module! It can fit very well with every device reaching to my shop. "The Mageplaza team has even changed the order of elements and fix a Magento bug for me. We are very happy with this extension and the support." Checkout page with Responsive functionality is able to well adapt to any screen sizes and any devices such as PC, tables and mobiles. Now, Gift wrap is one of the wonderful features of One Step Checkout. Your customers want to send their friends pretty wrapped presents? Help them complete the order with gift wrap option. Make your shoppers entirely satisfied with your store by supplying and delivering the gift message to their beloved. 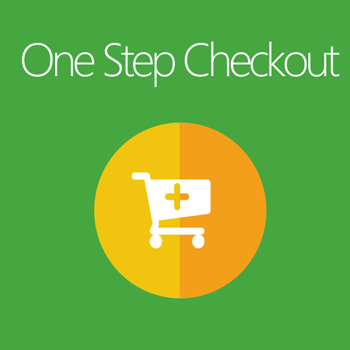 One Step Checkout extension supports your shoppers to log in right on the checkout page. Also, the extension allows checkout as a guest or register at the same time. Automatically detect the customer’s location based on its IP address, then set default Country field. Allow buyers to leave comments on the order at checkout so that their demands can be communicated more easily. Your shoppers can easily apply the coupon code via the required field on the checkout page. The discount will be counted automatically and directly into the order. The smart calendar field not only allows the customer to note their favored time to receive the items but also helps to build a better management system. One step checkout extension can auto-detect the entered existing email which customer used to register on your site. The module allows you to add a custom CMS static block on the thank you/success page. You can easily customize promoting cross-sell products, services on the success page. Customers leave a house/building security code on the checkout page, it helps shippers deliver items more easily. Allows detecting which step causes the most abandoned carts by recording figures of cart abandonment rates and conversion rates at every single step. Q. Some addresses are not suggested in the dropdown list? All data of the address is based on Google Database, such addresses will be included as soon as Google updates the database. Q. Is it monthly fee? No, it is one-time payment, and there is no hidden cost. Q. Can I set an address with the street name placed before the home number? Yes, you can custom it easily from Google Places. Q. What edition does this module support? Mageplaza One Step Checkout is compatible out-of-the-box with Magento Open (Community), Magento Commerce (Enterprise) 2.1.x, 2.2.x, 2.3.x.. It does not support CE, EE 2.0.x. Q. What are the differences among One Page Checkout, One Step Checkout and Magento 2 default Checkout? 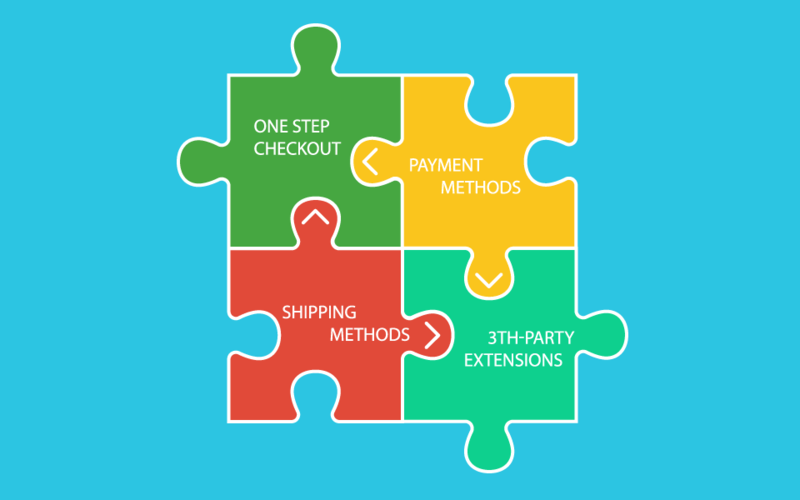 One Step Checkout and One Page Checkout, both, simply are names of a Magento extension, which helps optimize the checkout process more effectively than Default Checkout by eliminating unnecessary fields and updating automatically the order information via AJAX technology instead of showing multiple checkout steps . Magento 2 One Page Checkout by Mageplaza is one of the most advanced Checkout extension. It comes with powerful features which help you increase the conversion rate dynamically. Q. Can I install One Step Checkout on our test sites? Yes, definitely you can install on one live site installation and one test site installation. If your store is running multi-stores, multi-domains in the same Magento installation, we count it One installation/license. Q. Can I install it by myself? Yes, you absolutely can! You can install it like installing any extensions to website, follow our Installation Guide. Otherwise, you can purchase Installation Service option, our Magento experts will install on your website within 24 hours and resolve any issue arise during the installation. Q. I am using a custom theme, is it compatible with our design? We have developed One Page Checkout based on Magento 2 coding standard and best practice test on Magento Community and Magento Enterprise site. So it is compatible with themes and custom designs. Feel free to contact us if you have any problem with your design, we offer free compatibility service in these specific cases. Q. Does One Page Checkout support multi-stores? Yes. Our One Page Checkout supports multi-stores. You can use multiple stores in the same Magento installation. Q. When can I see the terms of service and privacy policies? Mageplaza One Step Checkout extension for Magento 2 comes with two versions: Standard and Professional. Check out the full feature comparison table below to get an overview. Add New Field to Checkout Page Learn how.